Usually the hardest items to pack for a move are the heaviest and most cumbersome. You not only want to protect the item from damage during the move but will need to move these heavy items without hurting yourself as well. As the premier movers in Kamloops, we would like to offer you the following ways to pack and protect your heavy items during your next move. Sturdy cardboard boxes. Make sure that all your boxes are made of durable cardboard. Try using double-walled boxes for your heavier items for extra security. Thick wrapping material. Just because an item is heavy does not mean that it is fragile or breakable. Use heavy wrapping material such as multi-layer bubble wrap to protect heavy items from damage. Moving blankets or thick blankets can also be used to provide extra protection during the move. Packing tape. Not all packing tape is created equally. Make sure to use a quality tape to reinforce your boxes and to keep your wrapping in place. The heftiest and most awkward items you will probably move will be various parts of furniture. 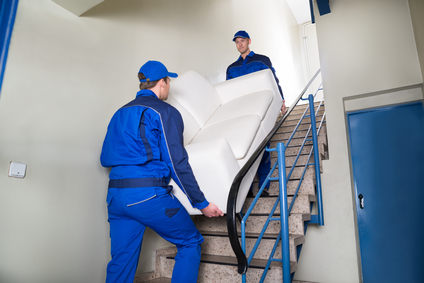 Here is a brief guide on how to move these large pieces in a safe and effective manner. Disassemble heavy or cumbersome parts of furniture. Store all screw, nuts, bolts etc. in a labeled bag and tape the bag to the piece of furniture for easy reassembly. Protect each piece of furniture. Wrap and tape the individual parts of the furniture and cover them with blankets to avoid any damage during the move. Unplug electric appliances from their power sources before moving. Empty shelving or drawers from heavy appliances before moving. If you are moving your refrigerator or deep freeze, make sure to defrost them at least 48 hours before the move. Tape and secure all appliance doors to prevent from opening. Wrap and protect each appliance to avoid damage or scratches. Do not over pack heavy items into boxes. You do not want to injure yourself when carrying the boxes. You also do not want the bottom to drop out of a box mid move. Never pack heavy items with other breakable items. Fill empty space in boxes with paper or other packing material to prevent shifting or damage during the move. Label heavy boxes and never stack these boxes on top of lighter ones. These simple guidelines should allow you to move your heavy and cumbersome belongings safely and effectively. If you would like more information on how to move heavy items or are interested in the many moving options and services that we offer, please call us today. Our friendly and professional staff would love to be a part of your next move.